EDMI’s demonstration of the practical application of smart metering for consumers was a crowd-pleaser at the Smart Utilities Australia and New Zealand exhibition held in Melbourne at the end of November. Identifying key integration possibilities between smart meters and smart-phone and other consumer applications, EDMI was able to show Australian and New Zealand industry players what was possible today with EDMI’s ingenuity. Display real time power consumption on an iPhone; then based on the level of power consumption perform an operation (turn on/turn off) on everyday consumer appliances. The demonstration required modified Storm code which is EDMI’s latest headend software. 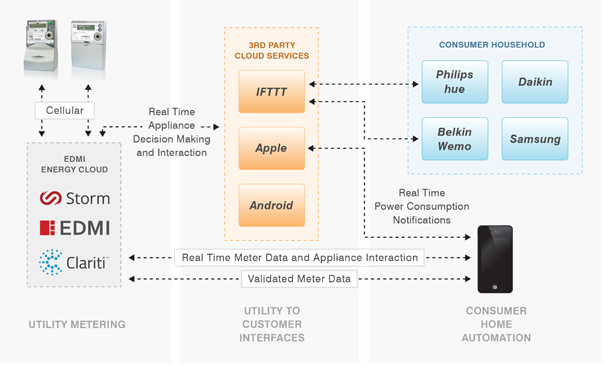 This created a lightweight communication server that could a) establish constant real time communication with a meter, b) provide real time power consumption to an iPhone app and c) integrate with consumer appliances to perform appropriate actions (e.g. turn fan on/off).